Map of Europe used by American politician Samuel Atkins Eliot on his 1821 'Grand Tour' of Europe. 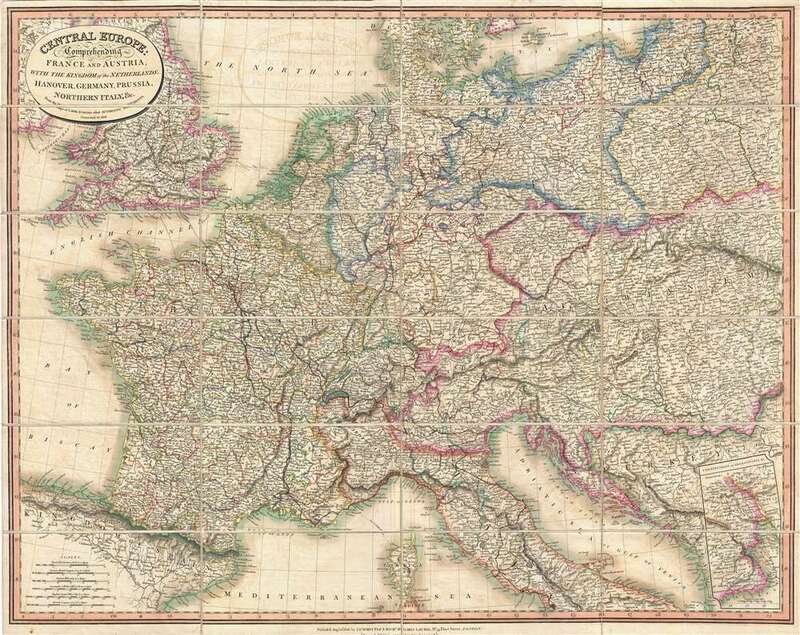 Central Europe: Comprehending France and Austria, with the Kingdom of the Netherlands, Hanover, Germany, Prussia, Northern Italy, & c.
A fine example of Laurie and Whittle's 1818 map of central europe. The map covers most of europe but focuses on the nations of central europe: France, The Netherland (and Belgium), Austria, Hungary (with an inset of Transylvania), Prussia, Switzerland, and Germany. england, Spain, Italy, Turkey (the Balkans), Poland, and Denmark are included only partially. Laurie and Whittle identify all major towns and roads as well as limited topographical features, with elevation rendered in hachure. The cartographers credit the work of French map publisher Pierre M. Lapie as the source for this map. First issued in 1816, this is the second edition, 1818, of this useful map. Subsequent editions were issued in both case, as the present example, and atlas format. Such maps were popular with American tourists on the 'Grand Tour,' including this maps original owner, Samuel A. eliot. Unlike most antique maps, this map has an interesting and known provenance. It was used by the American politician Samuel Atkins eliot (1798 - 1862) on his 1821 european tour. At various points in his career, eliot, a Whig, served in the Massachusetts Senate, was the Mayor of Boston, and represented Massachusetts in the United States House of Representatives. eliot traveled to europe on the classic 'Grand Tour' in 1821. Sailing from Boston, he landed at the port of Liverpool, where he most likely acquired this map at the shop of W. Robinson, Castle Street. He traveled throughout england and Scotland before embarking for the continent several months later. eliot landed in Dieppe and traveled to Paris, then south to Toulouse before turning eastward to Italy where he traveled as far south as Naples before turning north, to Switzerland, Germany, and Holland. From here he either returned to France or departed directly to england, and thence to Boston. Very good. Original linen backing fragile and split in places. Some pen marks relating to Samuel A. Elliot's 1821 voyage. Comes with original cardboard slipcase.